Oh Em Gee This Is Good: Banana Cake (with Banana-Cinnamon Cream Cheese Frosting)! I have a banana problem, I buy them and never seem to eat them all before I've already come up with another banana themed dessert to try. It's always the same pattern; I buy some bananas and end up eating them with breakfast for a day or two. Then I notice a new banana dessert online (usually Pinterest) and suddenly the banana's are spoken for, they sit patiently awaiting their destiny. 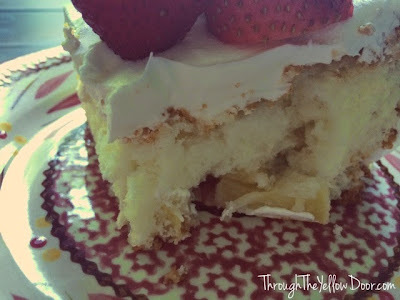 This time, I kept seeing a banana cake appear in my Facebook feed from Taste Of Home. I was curious, and loved the idea but knew I wanted to change some things. First, I always want to make layer cakes, old fashioned looking ones (hence my obsession with Pollyanna Bazaar Cakes) so I knew the recipe would need to change a little bit to accommodate that. Also, I'm a butter fan (yes, I know) so I wasn't going to go the shortening route. It took awhile longer to make the banana cake recipe but ultimately, the flavoring is the same. 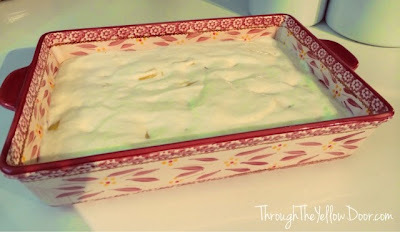 It's really just a wonderfully delicious banana bread with banana-cinnamon cream cheese frosting and it's heavenly!!! 1.) Mash 3 to 4 ripe bananas into a mixing bowl. 2.) Using an electric mixer, beat the bananas until there it's liquified and no large pieces of banana remain. 3.) In a separate bowl, add your dry ingredients; all-purpose flour, baking powder, baking soda and salt. Mix together and set aside. 4.) In yet another bowl, the largest this time, add your sugar and butter. 5.) Cream together butter and sugar. 6.) After mixing for about 3 minutes, the butter and sugar mixture reaches a nice fluffy consistency. 7.) Add your eggs to the butter and sugar mixture and mix under throughly combined. 8.) Next, add your vanilla to and give the batter one last minute of mixing to achieve maximum fluffiness (aka: awesomeness). 9.) Now it's time to add the liquified bananas. Simply fold them into the butter and sugar mixture. 10.) 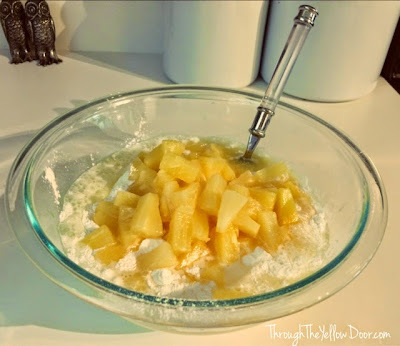 Add your dry ingredients into the batter and mix it for 1 minute. 11.) 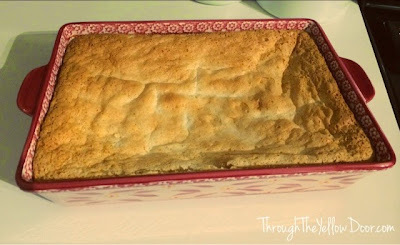 Add your batter into 2 greased and floured 9 inch cake pans and bake for 30 minutes. 12.) The cakes are done when a toothpick inserted in the middle comes out clean. They will be beautifully golden brown. Place cakes on baking tray to cool completely before frosting. Mix together mushed bananas (I used just 1 whole banana), 1/4 cup butter (room temperature) and 5 cups of powdered (confectioners) sugar. 14.) Add 8 ounces of cream cheese and 1 tablespoon of cinnamon to the banana mixture. Using an electric mixer, beat for 3 minutes on high. Once finished beating, your frosting is ready!! 15.) Here's where perfectionists can level out the tops of their cakes. I left them "lumpy" to help with the homemade and old fashioned appeal :) Place the bottom layer on the cake stand and get ready to frost away! 16.) First I topped the bottom layer with a healthy helping of frosting! 17.) Next, I added the top layer. It looked like a giant whoopie pie and I wanted to eat it like it was one! 18.) I added more frosting to cover the entire cake. ALL the frosting! 19.) Since I was going for the old-fashioned, homemade look I kept all the imperfections in tact from the frosting process and added a few vanilla wafers to the top for garnish (and edible flair! LOL). We cut into it right away and it really is delicious! 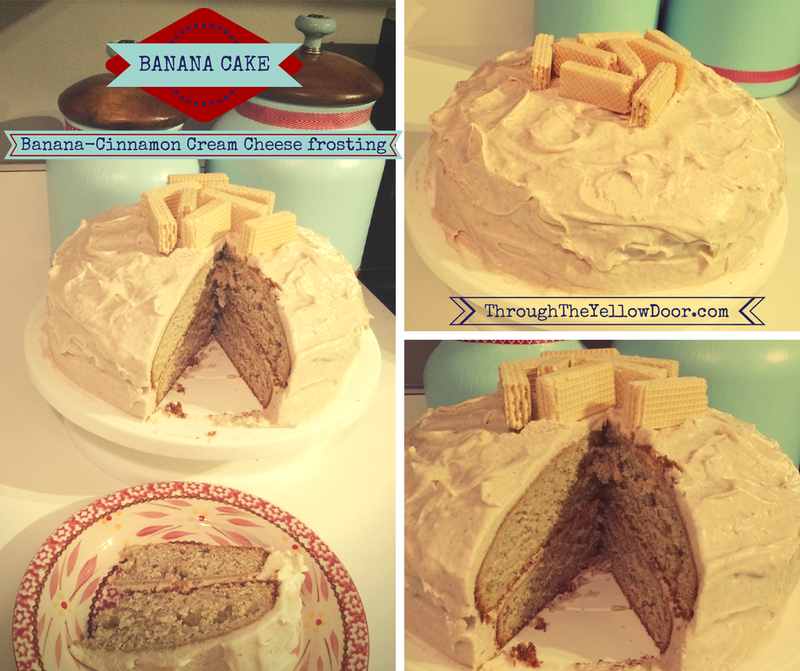 One big piece of banana bread with awesome banana-cinnamon cream cheese frosting! 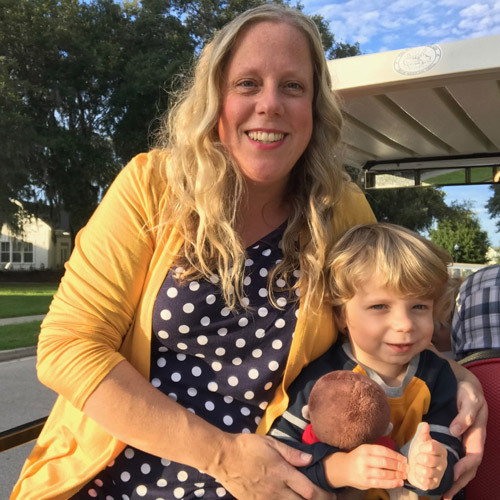 As with the past 2 Tuesdays, I'm linking up with with Coping with Frugality, Full Time Mama and Eat Drink & Be Mary, for Delicious Dish Tuesday! Don't forget to check out all the amazing recipes they featured this week! 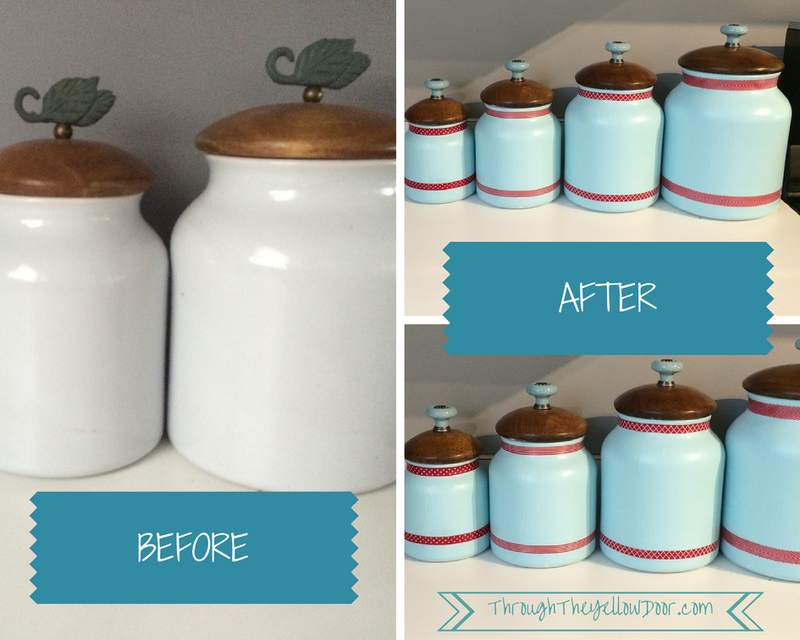 Easily Update Kitchen Canisters With Paint and Mod Podge! 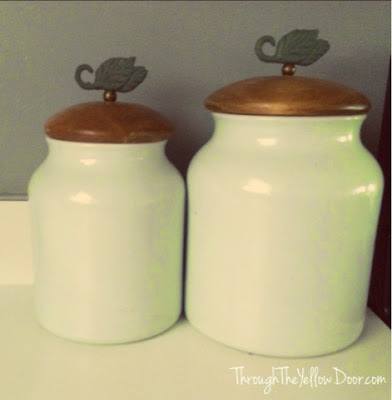 I've had the same kitchen canister set since college and they've been looking pretty sad and boring for awhile. I've thought about purchasing new ones, but didn't see the justification in that since these were still completely functional. I've seen some pretty great ideas for quick canister makeovers on Pinterest and decided it was time to take on the project myself! 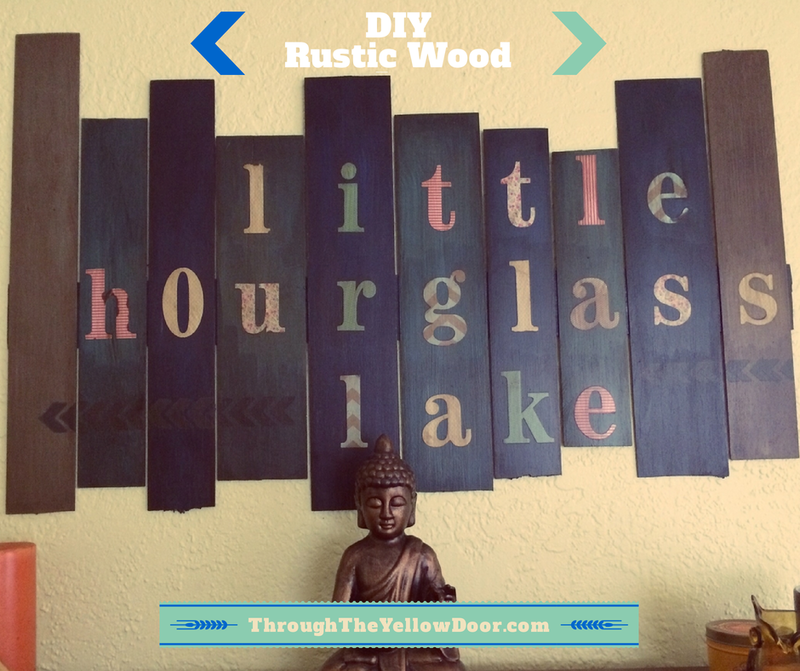 It really was a quick and easy project! All I needed to purchase was new knobs for the tops, I had everything else I would need on hand in my craft supply arsenal. 1.) 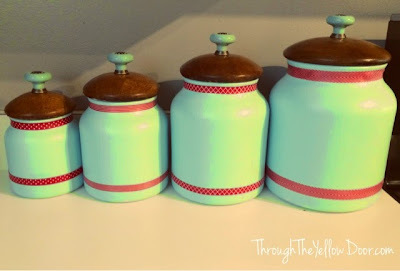 Paint your canisters with your selected acrylic paint color (could use spray paint as well but I'm an acrylic paint kinda gal) and let it dry. 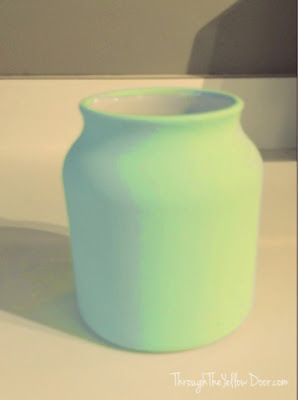 I selected a beautiful ice blue color. In total, it took 2 coats of paint on each canister. 2.) Once the paint has fully dried, it's time to apply the ribbon detail! 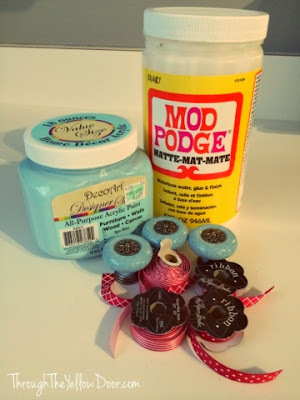 Simply apply the ribbon to the desired location with Mod Podge (of course, duh!) and let it dry fully. 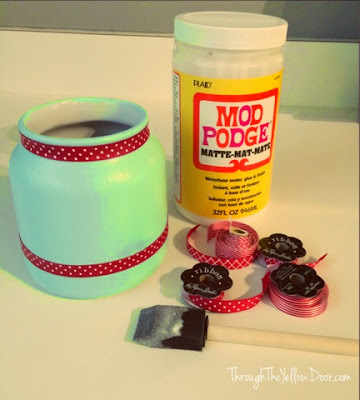 I actually just used Mod Podge all over the entire canister to seal the paint so that it wouldn't chip, I'd recommend you do the same. 3.) The last step is simply switching out the existing (ugly and sad) knob hardware with the new updated ones. And that is IT! Now, they're all updated and look so much happier in the kitchen now! When I was younger, I was obsessed with The Beach Boys song Kokomo. Not just because Uncle Joey (from Full House, duh) played that song with them but I'm sure that had something to do with it, LOL. 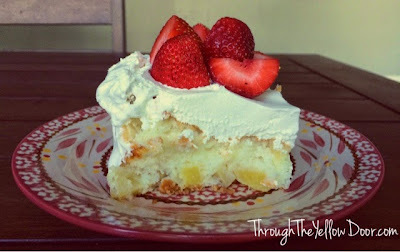 I also thought one of the lines was "tropical cake melting in your hand" and always wanted a piece of tropical cake. It wasn't until I was older that I realized they were saying "tropical drink melting in your hand", which made WAY more sense. But, I still catch myself thinking about that magical tropical cake I imagined as a child whenever I hear that song. I heard it yesterday and it inspired me to make that dream into a reality. However - I've been doing some serious baking lately and really didn't have the room in my waistline for another high calorie creation. So, I did some Pinterest searching (Pinterest is pretty much my Google, anyone else find that the case?) and found some great ideas for lower calorie options. 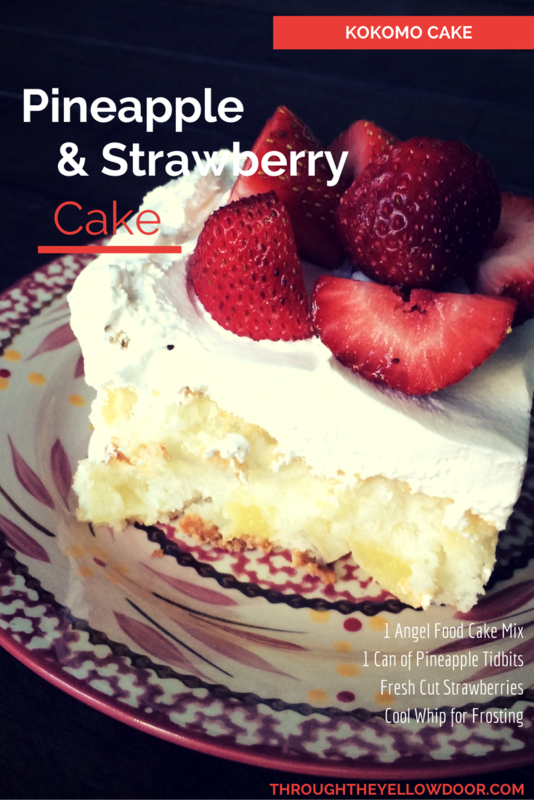 It seemed, I could simply add canned fruit to an Angel Food cake mix and viola: cake! 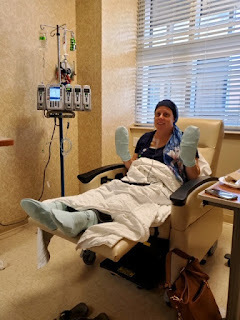 I was pretty excited about it, easy and not SO bad for me. 1.) 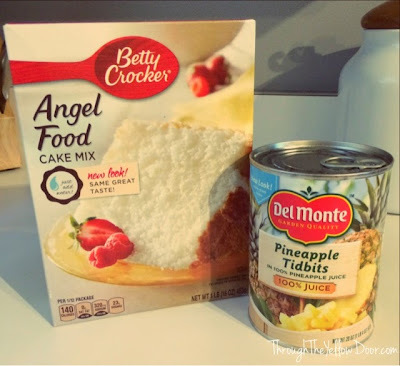 Mix the Angel Food cake mix and a full can of Pineapple Tidbits. No need for an electric mixer, just fold it together by hand. AND, in to be completely honest, I ate a piece for breakfast this morning! I mean, it has fruit in it and it's not too heavy, so I figured why not! It.Was.So.Good! I'm linking up with Coping with Frugality, Full Time Mama and Eat Drink & Be Mary, for Delicious Dish Tuesday! Don't forget to check out all the amazing recipes they featured this week! 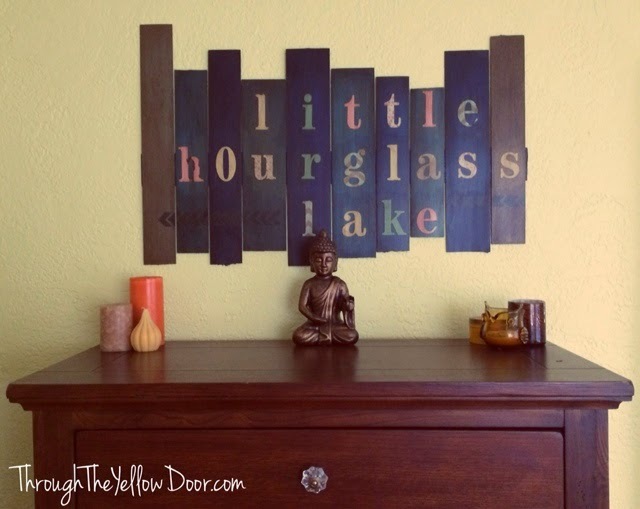 I've been lusting after all the wood-pallet DIY projects that are all over Pinterest (speaking of, do you follow me on Pinterest? Cause you totally should). But, I didn't have any wood pallets sitting around and although I could "steal" one from the back of Home Depot, I'm terrified of doing that. So, I went to the craft store (this time it was JoAnn Fabric) and noticed they had some unfinished wood pallets I could buy but they were already assembled AND over $20. I'm currently poor, so that was not within my budgetary constraints. Instead, I opted for buying 8 random sizes of balsa wood ($.89 a pop people!). The issue with balsa wood, is that it is extremely thin, so you can't exactly use nails or anything to put it together (not an issue for me, hot-glue gun lover over here! Holla!). Here's all my pieces of balsa wood ready for me to get to work! 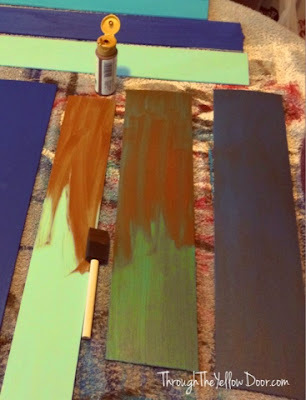 The first thing I did was paint all the pieces of wood with acrylic paint. 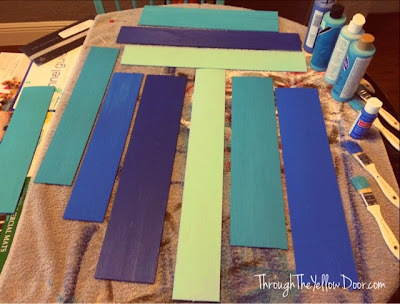 I was going for a nautical inspired look, so I used varying shades of blue (I already had these in my art supply arsenal so the cost was right!). After a few coats (2 total on each piece of wood) I let it dry. Once dried, of course I couldn't just leave them looking new and fresh (if you've been reading my blog, then you know I hate newly looking things, I want everything to appear as though it's been around awhile and has an awesome story to tell). So, I used some Folk-Art Antiquing Medium by Plaid (they make Mod Podge, so you know I'm loyal) brand antique gel and painted over the pieces of wood. Quickly wipe off the antique gel with an old cloth and let dry. 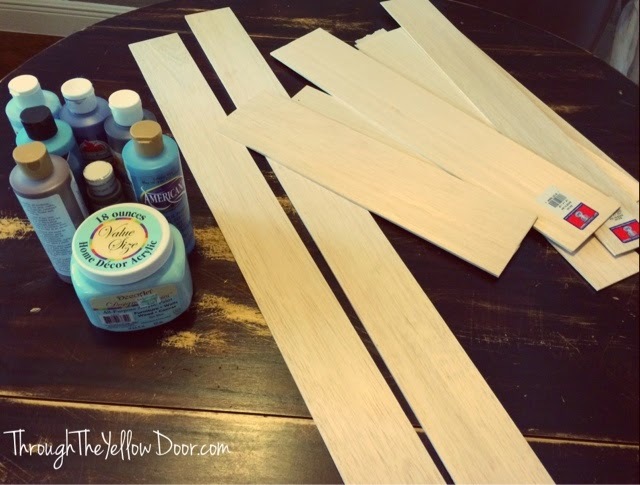 Once the pieces of wood are dry go ahead and use a hot glue gun to glue all the pieces together. 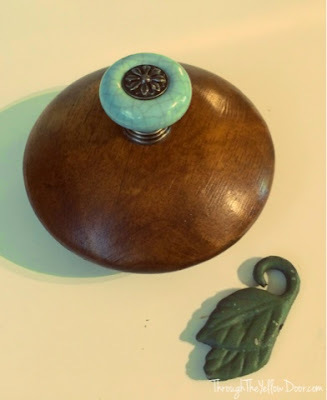 Once the piece is all together, start thinking about the design you want to place on it. At first, I was going to do a stencil of a sailboat and just the word "lake" (since we live on a tiny lake). BUT, finding a sailboat stencil that was the right size was impossible, so I went on to plan B. 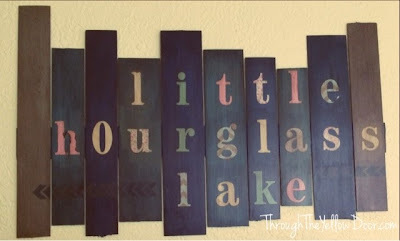 Which meant selecting adorable letter stickers to spell out the entire name of our lake (Little Hourglass Lake). I spaced out the letters until I was happy with them. 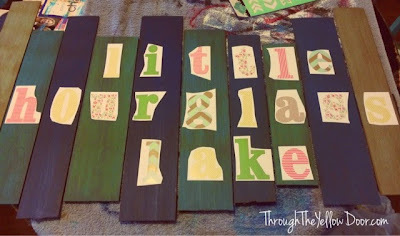 Once I was happy with the layout of the letters, I used my beloved Mod Podge and glued the letters onto the pieces of wood. 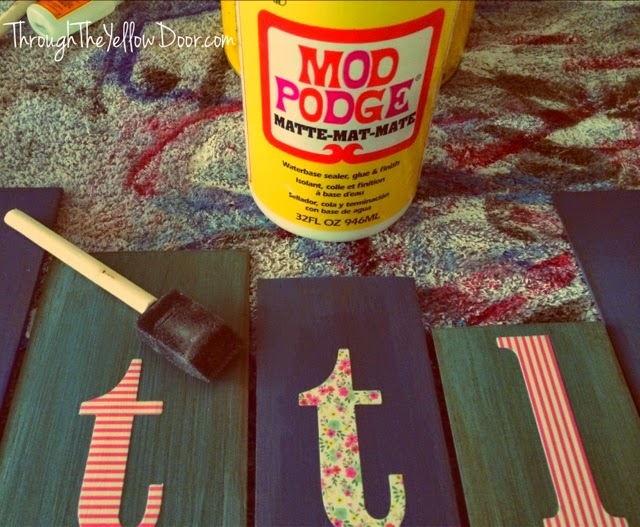 Because I'm in love with Mod Podge, I actually used it to seal the entire piece (even though plenty of places didn't have letters on it). I figured this way, the entire piece would have the same "matte" appearance. After the Mod Podge dried, I did a quick stencil of some arrows pointing in the direction of the actual lake (based on where I knew I was going to hang this up). Next, I went about trying to hang this puppy up on the wall. Which was super easy because it's balsa wood, which weighs next to nothing, so I just placed Command Strips on the back of it and BAM - done (I didn't even need to ask Matt to help - big bonus points for me)! 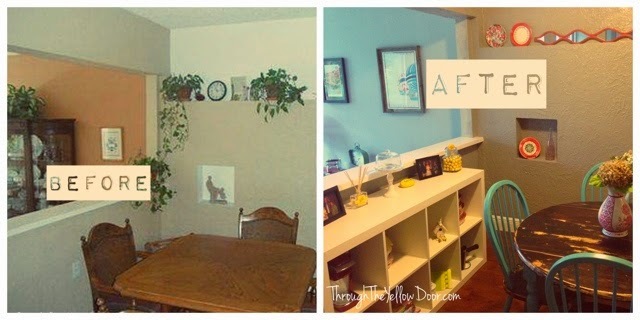 I'm slowly, but surely getting up pics of all our room transformations. 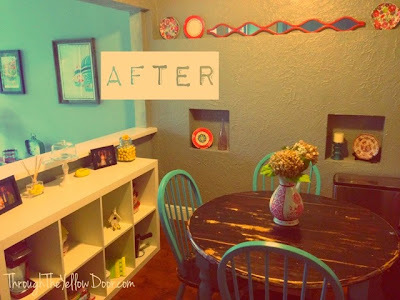 I already showed you the kitchen makeover (sorry for the poor quality pics, I'll try and reshoot when we have a sunnier day, the lighting that day was definitely subpar), but didn't show you the kitchen nook portion. When we moved in, the kitchen nook area didn't really need any major renovations, just paint and new floors (we continued the hardwood throughout the entire house because we're obsessed). 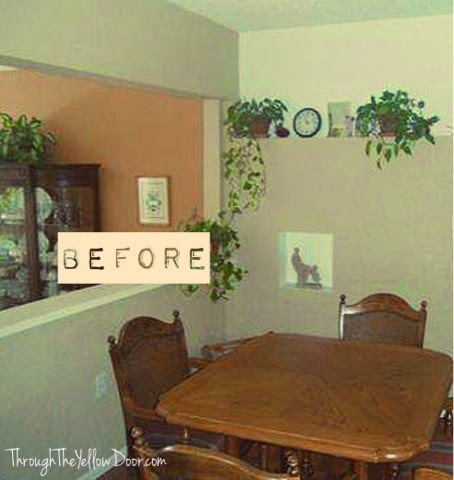 The kitchen nook was boring beige (you can also see that they had their dining room orange. 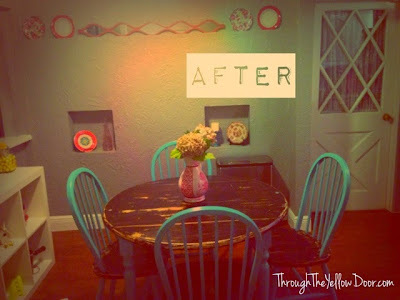 It was one side orange dining room, one side orange pool-table room (you can see what I did to their orange pool-table room in my dining room makeover post).